Tikal is an archeological site on an ancient Mayan city. It has been an UNESCO World Heritage Site since 1979, and is part of Tikal National Park. The city was the capital of a powerful Mayan kingdom. Some of the architecture can be dated back to the 4th century BC, but it had it's glory days between 200 AD and 900 AD. During these days it was a dominating force in politics, economy and military. 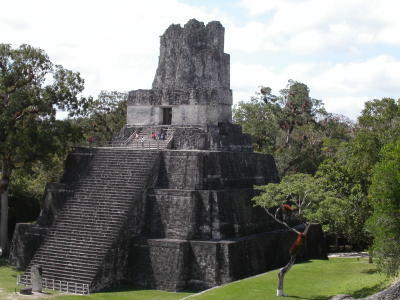 It is presumed that Tikal was conquered by Teotihuacan forces late in the 4th century. The new royal bloodline, however, was quickly absorbed, and the city became an important trade city between the two cultures. The site has been patially restored and contains many temples, royal palaces and monuments. Some of the structures are up to 70 metres tall. Today it is a major tourist attraction with it's own site museum.